First, I passed. For those into belt colors, that means I’m still a white belt. I’ll be posting the video (which I have not seen yet) later today. I wasn’t worried about passing, though. I was more interested in doing well. Or at least doing my best. I did OK. Only one or two brain cramps on techniques, and I didn’t shut down during jiyuwaza. A few minor “D’oh!” moments, but nothing horrid. On the good side, I knew the names of everything, and the basics of how each technique went. Watching the 4th kyu test (the next one I’ll have to take) I realized that I know those names and techniques, too, basically. And even a lot of the ones on the 3rd kyu test. I felt reasonably relaxed and present, and was able to breathe and focus pretty well. On the room-for-improvement side… I really felt like something was missing, like I was “demonstrating how the techniques go” instead of *doing* the techniques. Like kind of half-singing a song to get across what the lyrics are, as opposed to really putting it out there like you mean to be heard. It felt half-hearted, uncommitted, low energy… something like that. When I sat back down in the line afterward, while watching the others, I knew I hadn’t done my best, but I didn’t know why. I wished I could’ve had a second chance, to get up there and do it like I had intended to do it. “Darn it. That wasn’t how I meant to do that!” Oh well. An interesting life lesson there… How often do I – do we – start out with the intention to really knock one out of the park, and then fade into “wait, that’s not how I meant to do that” territory? Not for lack of skill, but from some momentary lethargy or lack of focus. Or maybe it’s fear of trying, really whole-heartedly Going For It, and falling flat anyway. I didn’t knock it out of the park. I’m not proud of how I did, from a performance standpoint. But on the whole I’m OK with it. It was diagnostic, revealing. I know now where I stand. My perception of how I did on the test was consistent with the feedback I got. Sensei said it seemed like I was “being careful.” I’m sure I was. I usually am a little tentative, a little light (not soft), and uncommitted, when practicing. Going through the motions. The reason I’ve been conscious of for that is that I’m not sure of the technique – not sure I’m doing it right – and that I’m afraid that if I do it wrong I’ll hurt my partner (particularly on things where one could bend joints in unnatural ways). I have also felt a general need to refrain from being forceful. I am reasonably strong, and it’s easy for me to slip into using strength to try to “make” a technique work. I am more comfortable with more powerful technique (on both sides of the partnership). It’s more familiar, and more fun. But I’ve been careful to try to keep that turned way down, to focus on finesse over force. Maybe, with some basic competency now, I can judiciously and correctly incorporate power into my Aikido. Another reason I’ve just seen today is that you can’t “really” fail if you aren’t “really” trying. 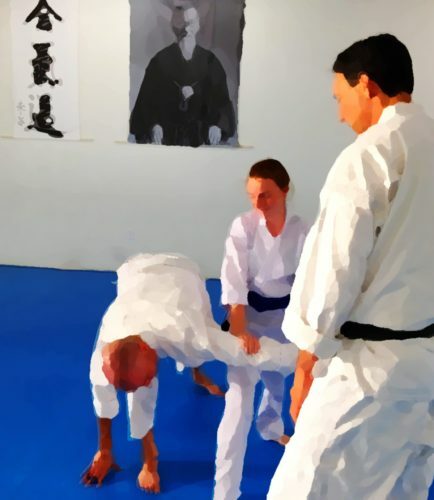 It’s time to start really trying; doing Aikido like I mean it, all the time. By that I don’t mean being stronger, harder, and more forceful with people. Just committed, honest, and real. Really strike. Really feel the energy. Really take Uke’s balance. Really do the pin. Really throw them. And if that means making some blunders and looking like a goof along the way, so be it. New goal: Do it “the way I meant to do it” every time. Really. The word “power” kept coming back to me today, and it’s not really the right word. Maybe more like decisiveness, firmness, leadership, sincerity, committed, intentional… Well, something like that.